This is one of my favorite verses. But, as you say, we need to claim it in every area of our lives and really live like we believe it! Loved your post and all that you put into it! Shanda, thank you so much for visiting and commenting. I deeply appreciate it. You have such a beautiful smile! Blessings to you! LOL Kristin, I love that…snap, crackle and pop! Reminds me of JJ of Good Times…Kid Dyno-mite! Thanks, sweetie, for your great comment! Bless you! I love this, Lynn. Love thinking about the power of God in me. We need to explode with love for Him and energy to do His will. Awesome post Lynn! I love the way you peeled this verse away, word for word, for us to discover the treasure within! Great job, great encouragement, thank you my friend. How many of God’s people have God’s dynamite available but it goes unused. In demolition, old dynamite becomes volatile, unstable and unpredicable. I wonder if that’s the case with those who are empowered by God and fail to do what God had purposed. Amen, Carol! Thanks so much for stopping by and commenting! Love hearing from you! Thanks so much, my sweet friend, Marja! You always make my heart happy! Bless you! Hey, Michael! Your first thought…how many of God’s people do not use His power was my point. We let other junk pile on and clog us up or we ignore His working and He cannot flow through us. I love your second thought…refusal would be very risky, wouldn’t it? When you think about it, it’s actually scary! Thanks so much for the added thoughts. I’m always honored to have you visit. You make me smile! Blessings to you! Awesome post, sweet friend! I really needed this today! I pray this for others consistently, but in need of some of that dynamite power myself! This is my favorite verse. I love how you left no stone unturned, revealing more and more truth. I needed to be reminded of this truth. And I appreciate Rev. Michael’s insight. Very timely. I have thought for a long time, that in this tool box God gave us, it is the power of the Holy Spirit that is used least of all. I am awed by the difference in Peter after the Holy Spirit fell on him on the day of Pentecost. He never turned back from working for our Lord after that. Wishing your family a blessed Father’s Day! Great post! 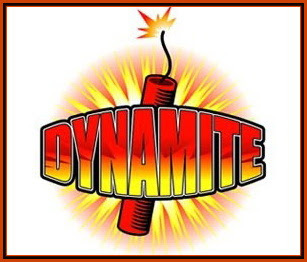 We should all get our dynamite sticks out and blow our idea of “power” right out of our minds! His dunamis is beyond anything we can imagine – therefore our potential is that much more effective when we let His power work within us! Your comment “if only we could begin to grasp the magnitude of His dynamite power and allowed Him full reign and rein in our hearts” is the essence of doing more for Him when He blasts through our human efforts for His glory! Susan, so happy to see you! It’s a great verse to have as a favorite. Thanks so much for your comment. Blessings to you! Maryleigh, you so right. We defeat ourselves without the Spirit’s powerful work. Love having you visit. Thanks, sweetie! Bless you! Oh, Deborah, it is so much more than we can imagine, isn’t it? We have no idea. If we only tapped into it…Thank you so much for commenting. Bless you! Awesome post, Lynn! I love digging deep into scriptures and exposing (and exploding) God’s truth. Makes me want to shout Hallelujah! I love the way you have with words my sweet friend- your gift is so beautiful. Thank you for the depth of tearing into His Word and yes, reminding us of what we already have. I love digging deeper into His Word and pulling out huge golden nuggets!! Aw, thank you so much, sweet Terrie! I so appreciate your kind words. I love digging deeper. So many gems to find! So glad you stopped by. Blessings to you! I want to be full of dynamite! God’s dynamite!!! Alisa, you’re a Kid Dy-no-mite! LOL Thanks for stopping by! Blessings to you!